Dean Cascione and Randy Ciak are old school shredders who build and modify Strats in the grand tradition of Blackmore and Malmsteen. In addition to hotrodding, aging and producing custom builds like our featured model, they are specialists at creating scalloped necks. Today's featured instrument, with two beautiful flame maple scalloped necks implements thru-body nylon strings on top, with a piezo bridge. Scalloped necks scare many players, but here are few key things to understanding them. 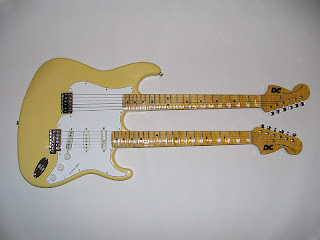 Anyone who's played an SRV Strat, or any guitar with jumbo frets, understands that string bending and vibrato are enhanced, as more of the finger surface is able to push the string(s), also making heavier guages possible (which require more push). Intonation is crazy, especially with chords, but you get used to it and adjust. A scalloped neck is obviously more extreme, but allows the player incredible bending/vibrato potential as well as textural enhancement possibilities in terms of allowing ultra fast sweep picked staccato lines to sound more fluid, graceful and legato-like. This partly explains why Yngwie's playing has a type of textural character you don't hear from other players within his genre. All that said, the touch, technique and ear required for this approach is considerable, hence we don't see scalloped necks played on every block. Good slide players deal with very similar aspects and issues, but from a different context, and likewise, good slide players aren't on every street corner. So there ya go (my shred pals are probably wondering what I smoked today). Hopefully this clarifies a bit of the mystery some may have about scalloped necks. Dean & Randy's websites provide lots of project photos, finished products, scalloped neck close-ups with beautiful cuts of maple. And they're just crazy about Strats!